Devotees of Krishna are special, and even among such special souls, some stand out among the rest. While there are those who become swamis or gurus or leaders in various ways, others live "ordinary lives of devotion." They perform their service effectively and enthusiastically, if also quietly, exhibiting exemplary character, a contagious service attitude, and a mood of dedication. The unfortunate thing is this: Few are privy to the glory of their humble endeavors. Akshobhya Dasa (1950–1979) is one such soul. Akshobhya was especially dedicated to the books of his guru, His Divine Grace A. C. Bhaktivedanta Swami Prabhupada, establishing a system and method of indexing that made his spiritual master's work accessible not only to the devotee community but to a much larger readership as well, including seekers and scholars. These were no simple indexes: Academics and literati outside the movement praised them for their clarity and breadth. And his contribution continues to this day, as indexers for the Bhaktivedanta Book Trust draw on his outstanding methods and procedures when indexing BBT books. Akshobhya's oeuvre included several volumes of Srimad-Bhagavatam (starting with the first one), The Nectar of Devotion, and the mammoth Krishna: The Supreme Personality of Godhead—important texts for Prabhupada's mission. Akshobhya's indexing days were cut short by a fatal knife wound to the heart. When a vicious assailant pursued a young devotee, with intent to kill, Akshobhya leaped in front of the cold blade, exhibiting a heroic side that defined his character. Even his work as an indexer indicated this same heroic tendency, if in a less demonstrative way. Indexing is the job of the unsung hero, since writers and editors usually receive recognition for their work while the indexer stays in the background, rarely getting his due. Accordingly, Akshobhya was an unsung hero in regard to Srila Prabhupada's literary work, and he was a hero in saving a devotee's life. There were magical, warm family moments, without doubt, but there was also a lot of rage. There was friction and little sense of security. All of this culminated when, as young boys, our dog was put to sleep in front of us. Bootsie had gotten into a neighbor's chicken pen, and our family had to make financial restitution. So Dad decided to bring her to the vet. We went with him and watched. I don't know why he brought us along. I responded by going within, becoming withdrawn, to a certain extent. But Akshobhya, then Eric, exhibited intense resentment. He couldn't tolerate this kind of injustice or cruelty. After this incident it became clear to him that the material world was a nasty place. 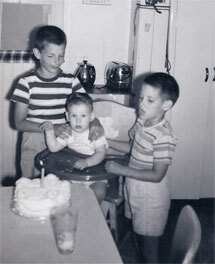 The boys were sent to Catholic school in Watertown, New York, where the family came of age. Soon they relocated to Schenectady, where high school years were spent at Bishop Gibbons. Here the teachings of Christianity were reinforced along with a superior academic curriculum. The Polish Catholic nuns, as Mark remembers it, conveyed a Christianity that was suffused with threats of hell—they preached fire and brimstone, condemning those who indulged in birth control, abortion, homosexuality, and so on. At the same time, they talked about a life of brotherly love while collecting their congregation's hard-earned donations. It seemed contradictory. "We were told about a loving God," Mark summarizes, "who, with just a little prompting, could send you to hell forever." This inconsistency, among others, made the Mausert boys turn away from religion. Eventually, the family moved to Binghamton, where in 1968 their father had landed a good job as a purchasing agent for the State University of New York (SUNY). Prior to this, Eric had stayed on in Schenectady, living with his grandmother. But time would reunite him with his dad. Always garnering excellent grades, Eric soon began courses at SUNY Binghamton. But his reunion with his father was short-lived: The same year that Eric arrived, the elder of the Mausert clan had died. Again, the harsh realities of material existence hit Eric with the power of a thunderbolt. He was a tall guy, maybe 6' 2"—an imposing figure—and extremely bright. He used to do the New York Times crossword puzzles in college—it was easy for him. I remember that he had a fondness for the story of Odysseus. In fact, that was his nickname. He seemed to love the idea of the tragic hero. His girlfriend at that time, Jean, was called Aphrodite. So you could say that this was a big part of his self-identity. Odysseus is considered one of the most important Greek heroes of all time. His story involves the Trojan War, a mythological battle waged by the Greeks against the city of Troy. Odysseus's contribution to the war was largely his brilliant Trojan Horse, a wooden structure with Greece's best soldiers hidden inside. This allowed the Greek army to sneak into Troy and end the war once and for all, emerging victorious. Eric felt that the world needed more heroes, people with integrity and character. He read many stories about heroic personalities of the past, great souls who dedicated their lives to helping others, and who would rescue people who came on hard times. He wanted to be like that. For this reason, perhaps, the Odysseus story stayed with him, molding his personality as he also adopted hippie culture and the other more common moods and attributes of his generation. Perhaps he wanted to be a hero; or maybe, subliminally, he was looking for someone to rescue him. It was 1970. 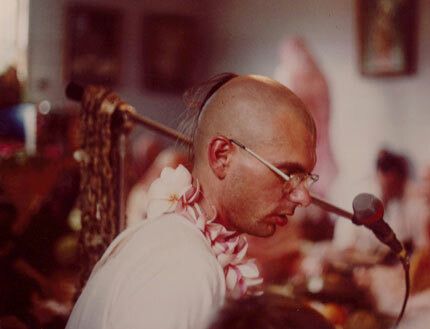 I was a student at Stony Brook, and that summer I was traveling around California with Dhanurdhara Swami [DDS], who at the time was Dennis, and two other friends. We split up into two groups, and I traveled with DDS to Los Angeles to meet Eric and his roommate Tom, who had left school at Binghamton, NY. We lived a hippie existence, eating brown rice and vegetables every evening. Eric was an intense, intelligent guy who was still looking for a direction. We would have animated discussions, and he wrote tight little poems full of wordplay and double meanings. He was tall and had a striking face. Tom was a musician, and they liked to perform a version of the Rolling Stones’ "Sympathy for the Devil." I played the harmonica with them, and we did it every time we happened onto a piano and a gathering. We all did the “whoo-whoos” while Eric pranced around like Jagger, singing with an invisible microphone in his hand and wearing dark sunglasses. We were tired of our nightly dinners, and so we agreed when Eric suggested we try the Hare Krishna Sunday feast in Venice [Blvd., off Watseka Avenue in Los Angeles]. I am not sure if that was his first time, but it was for me and DDS. We were hooked right away, and I carried a Gita in my jacket pocket the rest of the summer. Within a couple of years, DDS and Eric were devotees. Toward the end of the summer, the young men drove up the Pacific Coast Highway to San Francisco and met the devotees there as well. One of those devotees was Jayananda Dasa, an ISKCON luminary who inspired people with his sincerity and devotion. This meeting underscored the young men's attachment to the fledgling spiritual movement that now captured their hearts. He was there in 1971, before [the sacred images of] Radha-Govinda were installed. He told me that he helped carry Them into the temple when They arrived. Sri Sri Radha Govinda, the Radha-Krishna Deities in Brooklyn, were installed on March 3, 1972. So he was there during that period, but not long after that, he went to the gurukula [ISKCON's elementary school] in Dallas as an "alternative service" for the government. Apparently, he had pled guilty to evading the draft. His federal probation officer, Frank Waterson (now deceased), asked my mother what would happen if they put her son in prison. She thought for a minute and then told him that Akshobhya would have the whole cell block converted to Hare Krishna within a week. Mr. Waterson thought that was very funny, and he threw his head back with laughter. Perhaps to keep Akshobhya's influence out of the prison, they offered him alternative service. Akshobhya suggested teaching in the Dallas Gurukula. And they went for it. Texas and the "Krishna Bowl"
When gurukula was in Dallas in the early to mid-1970s, Akshobhya showed up, [and I immediately noticed his] tremendous intensity and energy. I remember that he was very philosophical and would discuss points in the philosophy by quoting from different parts of Srila Prabhupada’s books. But the service he relished most, it seemed, was cleaning the ashram and temple. Dallas had extensive areas that needed mopping in the ashram and the prasadam room areas, as well as the halls. Akshobhya would clean them all daily with tremendous energy and enthusiasm, chanting constantly as he did so, and in record time. It seemed to me that he could effortlessly do the work of several men. He prodigiously read Srila Prabhupada’s books and was able to quote entire passages of Krishna book from memory. In this regard, he created his own service: reading to the students from Krishna book and Chaitanya-charitamrita at breakfast and lunch. He would insist on absolute quiet and would read with tremendous excitement and drama. Breaking off from the reading from time to time, he would make exclamations of appreciation and amazement. In the afternoons, the children would have recess in the temple’s park-like area just outside the temple. Akshobhya had become incredibly inspired by reading the chapters from Krishna book concerning Shalva’s airplane. After stringing wires from tree to tree in the park and building a model of Shalva’s airship, Akshobhya made bows and arrows for the children, met them in the park, and while dramatically narrating the story would simultaneously direct the children in a pastime play which culminated in the firing of arrows at the plane as it hurtled across the wires by Akshobhya’s arrangement, bringing the plane to earth. The children went wild and loved this. He would also take them to various playgrounds for outings and would interact with them and play with them with great energy, encouraging them to chant as they played. At other times, he would assist them in enacting other pastimes from Krishna book in plays. In the evenings he would read to the boys as they fell asleep in the ashram. Most of the boys responded with enthusiasm to Akshobhya’s renditions of Krishna book stories. We divided up into teams and began to have contests similar to an old TV program called "College Bowl" where a host/MC would ask questions. In this instance, of course, we related it all to esoteric details found in Krishna book. There were girls’ teams and boys’ teams. The whole temple used to attend, and the adults also took it up. Akshobhya always functioned as the host and researched and composed all of the questions, all of which he knew the answers to and could quote the passages from memory. Lord Chaitanya chanted this prayer as a traveling sannyasi, especially while in the Jharikanda Forest. But Akshobhya would lead the chanting of this mantra in a newly conceived dramatic fashion, with a tune adapted from Beethoven’s Eroica. Naturally, everyone was amused and fascinated. The contests would then begin with him firing questions. Akshobhya had created an elaborate system of buzzers and lights that indicated who had rung in first, and as a result, the devotees began to more seriously read the Krishna book, and many of them began to memorize passages. Amongst the students, we had a boys’ team that few adults could compete with. I remember their names: Lila-smarana, Vrindavan, Markandeya, and Keshava, among others. Lila-smarana, the son of Akrura Dasa and Khandabasi, had the most prodigious memory, but the other boys were very sharp as well. This "Krishna Bowl," as it came to be called, had caught on in other temples, and a Los Angeles team headed by Jayatirtha and Rameshwara organized a multi-temple showdown during the San Francisco Rathayatra Festival in 1973. The boys’ team was undefeated until they ran into the LA team, but then LA had to contend with our gurukula adult team, and Dhrishtaketu led us to victory and the Krishna Bowl cup. After some time, Prabhupada expressed reservations about the contests, and so they were eventually discontinued. It seems Akshobhya had written to him about it in 1974, and he quickly responded with a concern that the elaborate contests might overtax the children or create an immature competitive spirit with negative consequences. Akshobhya was temporarily discouraged, but his enthusiasm for Krishna’s pastimes and Prabhupada's books continued to grow. Apropos of this, in 1976 he went to Los Angeles to work with the Bhaktivedanta Book Trust. He had an idea for developing indexes for Prabhupada's books, an idea that would soon bear fruit. Arriving in LA, Akshobhya walked right into the offices at the BBT and proceeded to spearhead what was to become the standard indexing system for Srila Prabhupada's literary works. Before Akshobhya's arrival, the books would occasionally include indexes, but not always. And even then, they were often crude and incomplete, making it difficult for readers to locate points of interest. Akshobhya helped make the books more accessible by developing superior indexes. He'd tell me how they would bring Krishna's pastimes to life with the children, making it almost playtime. I loved to hear his stories, and I was moved by his love for those children. I was sure he'd have loved to still be there for them, but evidently Krishna had other plans. Now he was needed to bring the books' pastimes to them, and to everyone else, through the best indexes to the best books in the world. . . . Akshobhya was always the one with the Kshatriya-like drive—single-minded, cranking out entry after entry, stopping only to debate a point, clarify a meaning, challenge our assumptions. He was completely dedicated to getting it right for his spiritual master. His absorption in this service was beautiful to watch, a level of surrender that still inspires me. It was January 1976. Having organized the BBT indexing during the recent “book rush” (Prabhupada wanted 17 books produced in two months), Akshobhya welcomed my [desire to help], took me to his BBT office, and showed me his system. From "Analogies to Zoomorphism," he spoke like a man possessed—“Godly-haunted,” as Prabhupada would say. I was astonished by his powers of association, all within the realm of Prabhupada’s books. Having organized the ill-fated “Krishna Bowl” a couple of years earlier at the Dallas gurukula, he was able to recite whole pages of the Krishna book and then reference those pages from myriad angles, letting them shine variously like the Lord’s vaidurya gem. Akshobhya drilled me in the main headings that come up again and again in Prabhupada’s books, as well as how to make key-word entries under those headings. The indexer’s job, he says, is to anticipate how readers may look up references in different ways. His system is logical, but it really rests on his encyclopedic and kaleidoscopic awareness of Prabhupada’s writings. The importance of quality indexes should not be underestimated. When executed properly, indexes help the reader locate information quickly and easily. A comprehensive and effective index is not simply a list of words and phrases, but a cogent map of a given book's contents, affording a serious student content locations, cross-references, and a useful assemblage of related concepts. Often, indexes go unnoticed. But serious students will miss them when they're not there or, worse, when they are inadequate. Moreover, even casual readers will feel the effects of a missing or poorly constructed index. In such cases, indexes are mainly noticed when they don't function properly, which leads to frustration and the inability to find what one is looking for. When readers can access information seamlessly and with little effort, i.e., when an index works as one expects it to, it serves the readers without applause. Still, the best of indexes are incalculably useful. This is what Akshobhya was shooting for, and he clearly hit his mark. An index should be an accurate, brief, concise, and neutral summary of and guide to the contents of a book. Its ability to anticipate the needs and perspectives of various kinds of readers (students, scholars, devotees, the mildly curious) both by the style of the entries and the appropriate cross-references (the glue that holds indexes together) is its art. The encapsulation of vast quantities of information in the aforementioned accurate, brief, concise, and neutral manner is its science. In the twenty-five years that I have been practicing law, and in my years as a student and reader before that, I never encountered a system of indexing as logical, practical, and useful as that which Akshobhya designed for Srila Prabhupada's books. Srikanta was Akshobhya's colleague in that adventure, and he helped teach me what the two of them invented. Nothing I have ever done as a lawyer required so much intense mental energy and intellectual dedication as writing indexes for Prabhupada's books. I can't understand how a good index can be written unless the indexer has love for the book's author and subject matter. The demand to create and to narrowly focus the mind—taking apart and processing every phrase, sentence, and paragraph word by word while keeping in mind all the other topics of the book and how best to craft the index to guide all sorts of readers—is not a task to be taken up lightly. It is consuming in its demand for commitment. I saw Akshobhya sit for sixteen hours a day, creating mountains of index cards while writing the masterpiece index for Krishna: The Supreme Personality of Godhead. It was like watching Hercules perform his twelve labors. Akshobhya nurtured my spiritual life from the time I was thirteen, when he gave me a copy of Krishna book. I had already rejected God in the form of an overbearing father figure who would send me to hell forever if I messed up. Now, here was God in the form of a lovable child, a heroic teen, and an adventurous prince. And, He was being handed to me by someone who reflected many of those qualities. Akshobhya loved me like no one else in my family did or could. Even as a young teen, I knew there was something different about how he treated me. In later years, I came to understand that his love for me was unique because it had a basis outside of our family connection. He didn't show me kindness and spend hours reading about Krishna with me just because I was his brother. He saw me as a spirit soul, just as Prabhupada had taught him. I came to believe in God again because of him. Akshobhya had such potency and intelligence that he could convince almost anyone that God existed and that His original form was Sri Krishna. But what really stayed with me, and is with me today, forty-two years after he introduced me to Krishna, is his sense of conviction and love. I wanted to be as kind as him, as heroic and powerful as him (although I knew I could never reach that level and became content to just admire it in him). If he loved Krishna, that was good enough for me. If someone like Akshobhya vouched for Krishna, He must be real. In LA he had some medical issue, and a woman showed up trying to distract him with marriage, a marriage he wasn't interested in. So he came home to Schenectady and established an indexing area in our TV room. I remember him working on the Krishna book index there. Most temples didn't want to maintain someone who sat in one place and wrote indexes all day; so he stayed at our home for a few months. Finally, Radhavallabha [who was in charge of the BBT] called him and asked him to come back to LA. Akshobhya was very excited, explaining to me that Radhavallabha never called anyone to come back to the BBT if they left. But Akshobhya had unique talents. Anyway, after he received that call, I helped him shave his head, and Mark and I took him to Albany airport. That was the last time I saw him. It might be said that Akshobhya's "Trojan Horse" was his indexing system. Hidden in the back of Prabhupada's books, inconspicuously, they serve a vital function that is easy to overlook. The Trojan Horse of Greek fame was overlooked, too, but it was invaluable in accomplishing Odysseus's righteous ends. Of course, metaphorically, a Trojan Horse now indicates a ruse that often has negative consequences. No such negativity here: Just a brilliant plan to help people access Srila Prabhupada's books. Along similar lines, Akshobhya had ideas for Krishna conscious children's books. He wanted to take the information he had gathered from his spiritual master's texts and use them to help educate the movement's young. Thus, when he discovered that Govinda Dasi, an accomplished artist and a senior Prabhupada disciple, was interested in illustrating such books, he immediately made plans to relocate to Honolulu, her home base. After all, he reasoned, he could continue his indexing from Hawaii and work on this new project as well. It was time to visit the Big Pineapple. In Hawaii, mahalo is a word that expresses gratitude, a traditional way of saying "thank you." But it goes much deeper than that: it includes a sacred or spiritual component. The roots of the word are ma, which means "in"; ha, which refers to "the breath of life"; and alo , which indicates "being in one's presence." Ultimately, mahalo means "in the presence of the Divine," even if, in common parlance, it is merely a way of saying "thanks." Akshobhya heard this word quite a bit. He lived and indexed out on the deck under a roof-overhang above the driveway at the Honolulu temple that you had to access by climbing through the window of the Brahmachari ashram. . . . On his tiny make-shift desk (a board on two plastic milk crates) he had many hundreds of 3 x 5 index cards for doing the amazing Nectar of Devotion index. . . . He really was fearless and in many ways unconcerned about his physical body—so much so that on occasion he stood up to aggressive types, big local "mokes" who would harass the Harinama chanting parties . . . While still in Texas, Akshobhya discovered the Mahabharata. I would find him in an empty room in the old church building in the Dallas temple, striding back and forth reading it aloud and acting out certain passages. He told me with almost feverish excitement how the world of Kshatriyas and Mahabharata was inspiring him. He felt that he had been a Kshatriya in a past life, and he scarcely knew what to do with the energy these readings was stimulating in him. He wanted to fight and protect according to the high Kshatriya ideals he embraced, but he couldn’t really find an outlet. He would stride about reading and enacting the Mahabharata pastimes in a deep voice and in Shakespearean style. Some devotees thought he was a bit eccentric, but no one could deny his attraction for Krishna’s pastimes. He wanted to bring these stories to children, especially, and he felt that they conveyed the teachings of Krishna consciousness quite clearly. Govinda Dasi’s association was an emotional balm for me. She was a connection to Akshobhya, but she became like my big sister, too. At a time when I was deep in grief and pain, she befriended me. I saw her as yet another blessing that Akshobhya brought to my life. Akshobhya Prabhu would engage the kids in numerous ways. He often pretended to be a demon, and the kids loved it! He would raise his arms upward, make his hands into claws, and declare himself a "dangerous child-eating demon." He would say, “I am a demon and I am hungry. Come here at once! I am going to eat you!” Then he would roar and show his teeth, widely opening both his mouth and his eyes to playfully scare them. The kids would laugh and scream and run away. Akshobhya would then tell them: “There is nothing you can do because I am coming to eat you! The only thing you can do to save yourself is to chant! But you won't, and I know it . . . hahaha! Therefore, I will come and eat you!” Then he would take another step toward them and they would start screaming again. Inevitably, one of the kids would start chanting. At that point, he would act like the chanting was hurting him, as it would an ordinary demon. With a big frown he would cry: “No! No! No! Not that chanting! Not Hare Krishna! I hate that! Please stop chanting!" And he would dramatically cover his ears to avoid hearing the chanting. Of course, this would make them chant all the more. He was expert. The kids loved him for it. I remember him as a staunch disciple of Srila Prabhupada. As a Brahmachari, he was able to devote long hours to indexing, with his celibacy, no doubt, aiding his powerful memory. I remember one amazing quality in particular: He would often delight us all with a little contest. Someone would read a word or two [from Krishna book], and he would be able to cite the story that the word came from—they would read part of a sentence, and Akshobhya would finish it and could even tell them what page it was on. Totally incredible! All the devotees looked forward to it, and they saw it as a special mystic potency he had. It showed how deeply dedicated he was to his service regarding Srila Prabhupada's books. It was February 22, 1979. On this day, Akshobhya would perform the ultimate sacrifice, giving his very life for the devotees he so loved. Like Odysseus, he was willing to surrender all that he had to achieve noble ends—the Greek hero would do so to return to his wife, from whom he had been separated for ten years, but in Akshobhya's case, it was to return to Krishna, the Supreme Personality of Godhead. The day started like any other. Yet Akshobhya soon found himself with a valuable if temporary service: He would be assisting two new devotees, Steve and his wife, Janet, who had recently been married and joined the Honolulu temple. The couple's parents frowned upon their marriage and even more their affiliation with ISKCON. Janet's father had been a diplomat with the Philippine Consulate and was determined, perhaps through political machinations, to sway his daughter from living as a devotee. Because of this, the temple authorities determined that Steve and Janet would do well to start their life together at another center, and the newlyweds agreed. Thus, on the 22nd, they were to leave for Berkeley, but Janet's mother convinced them to visit home before proceeding to the airport. That evening, Akshobhya and Chaitanya Ballabha Dasa, another senior devotee in Hawaii, accompanied the young couple, not only because the couple needed transportation but because, as promised, they intended to visit the parents, who harbored ill-will toward the devotees. Sure enough, after a few pleasantries at the parents' house, their intentions became clear—they wanted Janet to change her mind and stay with them. But it went from bad to worse: According to the subsequent police report, a brief ruckus ensued, and the couple ran from the home. They were pursued by Janet’s less-than-rational brother, in his mid-twenties at the time, and her father. Chaitanya Ballabha, as an eye-witness, later recounted the rest of the story: The father picked up a stick and the brother a knife, shouting and following after them. Janet and Steve frantically called out for the two devotees waiting for them in the car. Akshobhya heard the screams and quickly made his way toward the commotion. As Steve came running by, Akshobhya stepped in front of him, blocking Janet's maniacal brother. Akshobhya raised his arms high above his head and roared like Lord Nrisimhadeva (the half-man/half-lion form of Krishna), hoping to frighten the brother away and thus avoid a further skirmish. But the fates had conspired to take Akshobhya that evening—it was dark, and he never saw the five-inch knife being thrust towards his chest. He thought it was a mere punch, as he flailed his arms downward with force, inadvertently knocking the knife to the ground. Although in a compromised position, he swung at his attacker, felling him with one blow. He next turned to the father, who was running toward Akshobhya with a stick, but by now he realized he had been stabbed, as blood streamed from his body. The father backed off as Akshobhya fell. It was like a scene from the Mahabharata, a great hero meeting his end. "He stabbed me, C.B. [Chaitanya Ballabha]," whispered Akshobhya. "He stabbed me with something." Chaitanya Ballabha managed to get him into the car, but he was losing a lot of blood. Steve reached the car, too, and they drove away. Pulling into a nearby gas station, they called an ambulance, but it was too late. Chaitanya Ballabha looked at Akshobhya and spoke his mind: "That's it for you, man. Think about Krishna, Akshobhya, think about Krishna!" In response, Akshobhya nodded his head, indicating that his mind was focused and that Chaitanya Ballabha could rest easy. Nonetheless, seeing the gravity of the situation, C.B chanted into his ear, softly but constantly, until the ambulance arrived. They took Akshobhya to the hospital, but the significant loss of blood had ended his life. Later, Chaitanya Ballabha called the police and identified the murderer. After two days, the brother was released from prison. His diplomat father was able to pull strings, it seems, allowing the young man to flee to his home country, the Philippines, thus avoiding the original indictment charging him with manslaughter, issued on June 5, 1979. As of the writing of this article, in 2012, he remains free, mainly because there was no extradition treaty at the time. Although such a treaty now exists, having been established in 1996, the authorities in Hawaii will not extradite him, citing the passage of time and witnesses’ “poor recollection” as their reasons. Justice is hard to understand. The law of karma dictates that there is an order to the universe, that for every action there is an equal and commensurate reaction. Criminals will get their due, if not in this life, then in the next. And so will the likes of Akshobhya. By dedicating one's life to God, and hearing His names at the time of death, one is assured a higher destination, if not the kingdom of God. In the Mahabharata, too, we hear of unfortunate deaths and of heroes who die untimely. "Surely," Subhadra says, upon hearing of the death of her son, "the course of destiny is difficult to comprehend, even for those who are wise. This is proven by the fact that you, whose protector is Krishna Himself, were killed in battle as if no one were protecting you." (Mahabharata 7.55.19) In the end, we have to admit that we don't see the whole picture and that God metes out reward and punishment according to a higher law. Sometimes, His sweet flute-music calls a devotee to another service in the material world, or back home, back to Godhead. The story of Odysseus's death cannot be found in either the Iliad or the Odyssey. But there are predictions about what was yet to come, and in a subsequent epic known as the Telegony, dated at roughly the sixth century BCE, we find the story of Odysseus's final moments, when he is bested during a fight he wanted no part of: He was pierced through the chest by a spear tipped with poison. The parallel is uncanny. As I conclude this article, a South Indian proverb about heroes and yogis comes to mind, and perhaps it reveals something about Akshobhya's sojourn: dvau imau purushau loke suryamandalabhedinau/ parivrad yogabhuktas cha rane chabhimukho hatah ("As the yogi can penetrate the sun's orb through mystic yoga, so, too, do heroic ones accomplish a similar end. Indeed, battle is in many ways a yogic exercise.") If yoga allows one to link with the Supreme, Akshobhya's supreme heroic sacrifice undoubtedly brought him to Krishna. After Akshobhya's passing, the devotees were nonplussed. One of their best had been taken by a knife-wielding assailant, and they nonetheless had to continue on. Their solace was in knowing that, due to his sincerity and the fact that he had died in Krishna's service, protecting a devotee, he would likely be born into a Vaishnava family, if not return to Krishna's divine abode. I was a van driver to the cremation site. When I got to the room, there was a tumultuous kirtan going on full blast. Premarnava Prabhu was leading, and there were drums and gongs and metal kartals. People were chanting and dancing and crying. Such a mixture of emotions! Some were happy that Akshobhya Prabhu was now beyond this material world with all of its sufferings. Some were still so sad and devastated to lose their teacher, brother, or friend. I saw the body enter the kiln, all decorated with prasadam flowers and other auspicious items. I had never been to anything like this in my twenty-two years of life. The employees there dressed in their customary black suits and stoic faces—they seemed unprepared for such a send off. But they got one last dose of Akshobhya’s preaching spirit in that kirtan. All glories to that great soul! Akshobhya Prabhu ki jai! I hadn't seen Akshobhya since I took him to the Albany airport two years prior. His friend Jita Vrata and I dressed his body for the funeral. I called the LA temple and received advice from a devotee priest about dressing his body in new cloth, putting Tulasi wood on the body, flower garlands from the Deities, and so on. It was a service I had to do, but it was the hardest thing I have ever done in this life. I kept it together through force of will. After the body was dressed and as it entered the fire, the kirtan was going full force. I remember tears streaming down my face and just losing it. A strong arm went around my shoulder and kept me from falling. It was Dvijati-pujaka Dasa, a close friend, holding me up. He was very kind. Later that summer , Kirtana-rasa, Akshobhya's brother, shipped two big boxes from ISKCON Honolulu to the LA BBT. The boxes contained Akshobhya’s masterpieces, happily completed before he died: his indexes for the Krishna book and The Nectar of Devotion. It took me all summer to sort through the 10,000 cards for The Nectar of Devotion alone. Even editing the cards down, the new Nectar of Devotion was published with a 103-page index in small type. The finest index I’ve ever seen in Prabhupada’s books. Only outdone later by the index he made for the Krishna book, his magnum opus. In 1979 I was living at the Denver temple when I heard of Akshobhya's passing. I was alone in an upstairs office in the rear of the temple room working on an editing project. I don't remember who told me of Akshobhya's murder. But upon learning of it, I felt like a knife had entered my own heart. It's hard to say much more . . . I was devastated. And angry. And so sad for the loss to his family and to his friends and of his contributions to Prabhupada's mission. . . . Of course, the Krishna conscious philosophy helps us cope, as does my knowledge that Akshobhya's contributions live on. Yes, without doubt, his contributions will surely live on. untouched will leave this human hall. Sri Krishna sees the depths I'm in.